PBWOA member Craig Kivi has put together several videos on the algae bloom that plagued many of our lakes in 2016. Green Lawns equal green lakes – at least if you want turf grass lawns. The algae problem started as the weather began to warm in the spring. Note: There is no narration for much of this video but the images convey the message. Algae growth like that experienced in 2016 and seen in the videos is the result of a number of factors but the main culprit is the availability of excess nutrients in the water. The PBWOA Board, along with Craig Kivi, discussed this issue at our July meeting. With the exception of Board member Bob Nester, who is an aquatic biologist, we don’t pretend to be experts on this issue. That being said, it is clear that a major contributor to the presence of the nutrients is the use of lawn fertilizers near the water. They are not necessary and they are harmful. Water from the lake already contains nutrients that lawns need. Use lake water for your lawns and gardens. You may hear people say that lawn fertilizers now being sold no longer contain phosphorous so they are safe to use. There is already plenty of phosphorous in lake sediment. The problem is that lawn fertilizers contain large amounts of nitrogen which is also an important contributor to algae growth. Lawn fertilizers are not the only contributor; nutrients also come from farm runoff and from what large waterfowl — swans and geese — “leave behind”. There are also other contributing factors of which there seemed to be a “perfect storm” in 2016. Mild weather, lack of significant rain, and few windy days all contribute to algae growth. Although much of the surface algae seems to have disappeared, there are still fresh blooms appearing. Algae starts on the bottom then floats to the surface and eventually breaks up and dissipates. 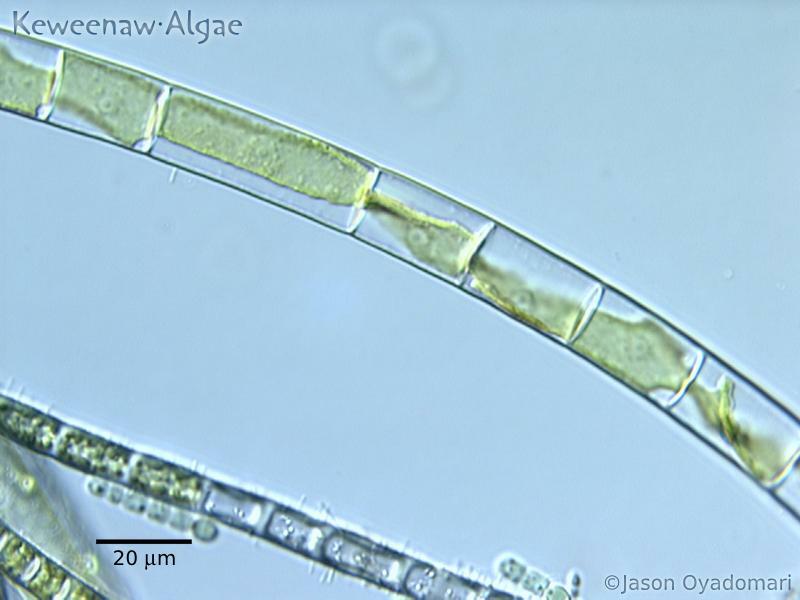 The material on the bottom may be the beginning of new algae or old algae that is decomposing. As it does so, it is using up dissolved oxygen which is needed by fish and other aquatic fauna. Craig took samples of the algae to NOAA scientist Dr. Rochell Sturtevent for identification. Her findings follow. The bottom sample is dominated by Spirogyra (80%) with smaller amounts of Zygnema and Mougeotia. The water column is the same – just shorter filaments, not quite as healthy, a little less Spirogyra and more of the other two. The floating sample from nearshore is pretty much the same, just more degraded – a few blue-green filaments in the mix – those may become more prevalent as the season progresses. In the plant beds, the filamentous algae are all dead and starting to degrade. I don’t think they are growing there (at least not well), just floating stuff getting caught in the plants. Nice healthy active grazer community (protozoans, rotifers, etc) munching on them. 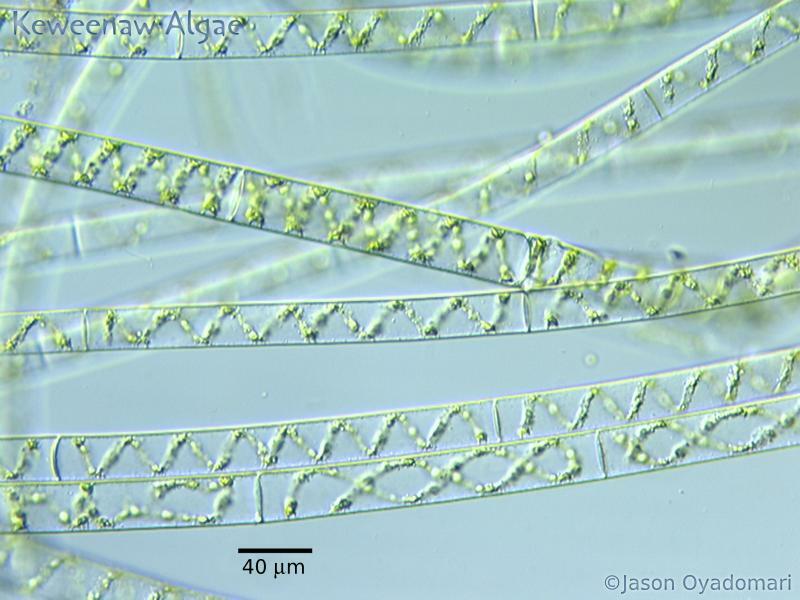 Under the dead filaments, the normal epiphytes (much smaller single-celled algae normally found on the surface of aquatic plants) all look healthy. While I’m happy to check the occassional sample for you, going forward you might want to do so yourself. All of these are species that can easily be seen and identified with a microscope in the 100-200x range – your local high school may have something you could use or there are many options that can be picked up quite inexpensively (<$100). I haven't tried them, but there are even models out now that attach to a smart phone and work via app. 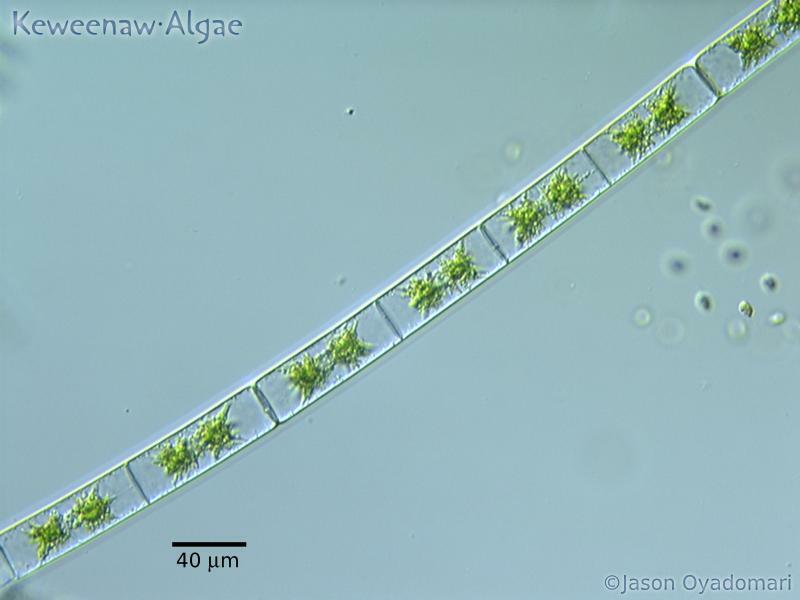 I have a 'field guide' available here which would let you identify what you have http://www.glerl.noaa.gov/seagrant/GLWL/Algae/Algae3.html I noticed today the links to Michigan Tech photos are redirecting to a home page — their photo index is here http://www.keweenawalgae.mtu.edu/genera_index.htm (it may take me quite some time to fix all those as I used their resources pretty heavily) they have some of the best photos showing the forms common in our region. With the understanding that I haven’t researched the specific situation … I concur that excess phosphorus is the likely cause of the majority of algae blooms in inland lakes in our region. This situation may be exacerbated by the presence of zebra mussels as well as by climate shifts, but as you have said, these are largely out of local control. Overuse of lawn fertilizers in proximity to water bodies has been documented to increase phosphorus levels in the water resulting in algae blooms – the same fertilizers that make for ‘green lawns’ also make for ‘green lakes’. I wish I could tell you that reducing fertilizer use would instantly return your lake to ‘blue’. Unfortunately, phosphorus also recycles within the lake – you will likely see a significant lag between reduction in fertilizer use, declines in phosphorus levels and reduction in algae. But failure to reduce phosphorus input will only see the problem continue to worsen. Most lakes in our region are phosphorus-limited. This means the lake already contains excess potassium (more than the algae can use) and at least some of the algae (blue-greens primarily) can fix nitrogen directly from the air. Adding more of those nutrients to our inland lakes makes little difference to algae growth – they already have more than they can use. In a few cases, green algae (which can’t fix their own nitrogen) can be limited by nitrogen even in our region – in which case adding nitrogen will stimulate growth. Just as important, marine systems downstream are much more often nitrogen limited – we don’t need to be passing those nutrients downstream. So in a nutshell – in the average local case, they are right that 10-0-10 would be fine. But you are ‘more right’ since 0-0-0 is the only thing that works for all cases and the globally responsible option.